The 2017 finalist's nerves showed early, but she rebounded well to win in three sets. 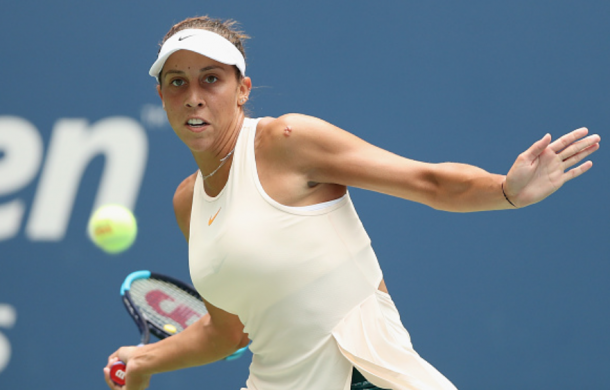 Last year's finalist Madison Keys faced off against a dangerous Aleksandra Krunic. Two of the Serbian's top-10 wins in her career have come at the US Open- Petra Kvitova in 2014 and Johanna Konta last year- making her quite a dangerous opponent. Krunic grabbed the opening set after breaking Keys in her opening service game, but a missed chance to break in the American's serve early in the second proved to be costly as the 14th seed only dropped three games in the final two sets. The Russian-born Serb took the lead in the opening service game. Keys discussed in her on-court interview after the match that she was too passive in the opening set, which was likely due to nerves. Krunic took full advantage of that. Keys missed a couple of routine balls down the middle into the net to give Krunic the lead. Other than Krunic squandering a 40-15 lead in the sixth game, both players were quite comfortable on serve. Krunic still held in that sixth game, taking the opening set 6-4. A backhand lob put Krunic up 15-40 to start the second set, but an overhead winner followed by a Krunic forehand into the net saw the game back to deuce. Back-to-back winners gave Keys the game as she looked to turn this match around. Keys began to find her rhythm as she began to construct the points better, rather than pulling the trigger too early. From 40-15 down, she clawed her way back, using her power and broke Krunic hitting a backhand down the line behind the Serb who could not do anything but just get a racquet on it. Krunic took a medical timeout after the third game to get her knee checked out as she fell when trying to go back and reach the ball Keys hit behind her on break point. The 25-year-old battled to hold to save two break points before the Serb got on the board in the second. Last year's finalist put a stronghold on the set after Krunic missed a forehand long to give Keys a second break in the set. Keys had no problem closing out the set 6-1. For the third straight set, the returner had break points. At 30-40, Keys hit a massive forehand cross-court return winner to break. The American saved break point once in the following service game, but she had some poor shot selection- playing a drop shot on the back foot at the baseline- giving the break right back to Krunic. It was an immediate break back for Keys who broke at love comfortably. It was another mistake for the 23-year-old American who missed back-to-back backhands to give the set a fourth consecutive break and leveled the set at two-all. Keys forced the fifth game to deuce with a forehand winner, and that forehand came in massive for her, breaking again to take a 3-2 lead. Down break point again, a timely kick serve forced an error from Krunic, and that timeliness, this time off the ground, came through for Keys to save another break point. The Serb's slice return flew long for the first hold of the set. A sloppy game from Krunic put Keys a double break, and the American capped off the match with her trademark forehand to move into the fourth round.